Text box options are only available for text boxes, shapes, and captions. They're grayed out for other objects (pictures, screenshots, and characters). This drop-down lets you control how high or low the text sits in an object. This drop-down lets you control the rotation of the text in an object. 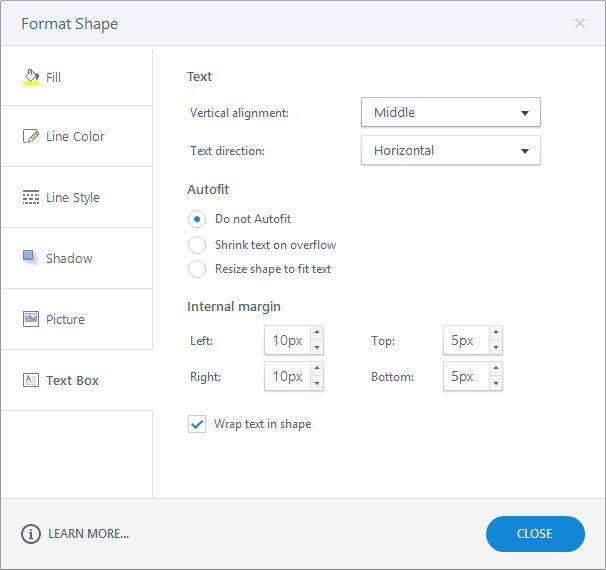 The Autofit property controls what happens when text is too big to fit within the text box, shape, or caption. Do not Autofit: This causes the text to overflow the object if there is too much to fit within it. Shrink text on overflow: This automatically adjusts the font size so the text fits within the object. Resize shape to fit text: This automatically resizes the object to accommodate the text. These settings let you control the margin (padding) in the text box, shape, or caption. Enter values in pixels or use the arrows to adjust the values. When marked, this option wraps text within the text box, shape, or caption. It's marked by default.